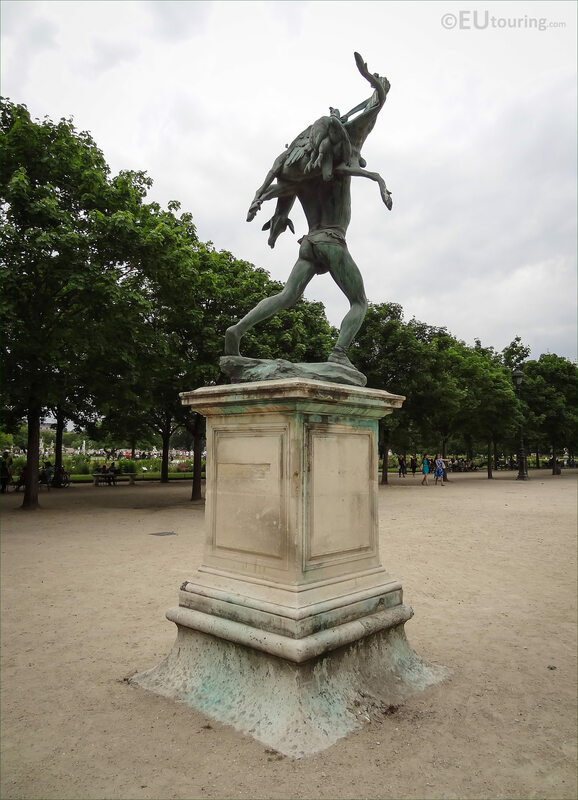 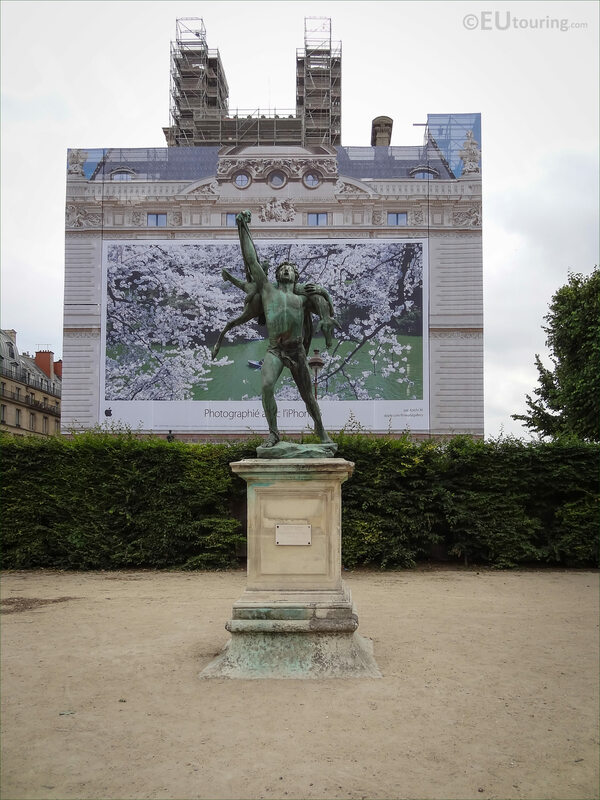 We were again the Jardin des Tuileries within the 1st Arrondissement of Paris when we took these high definition photos showing the statue called Retour de Chasse, which was sculpted by Antonin Carles. 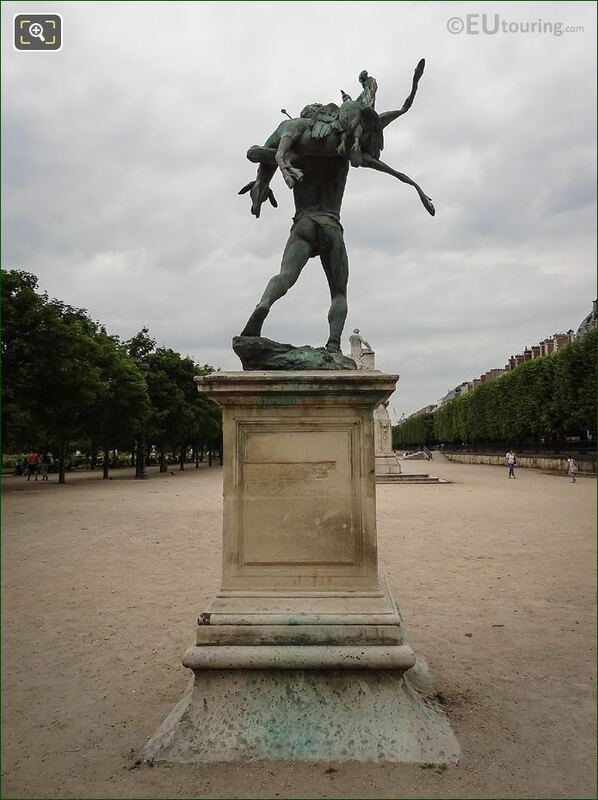 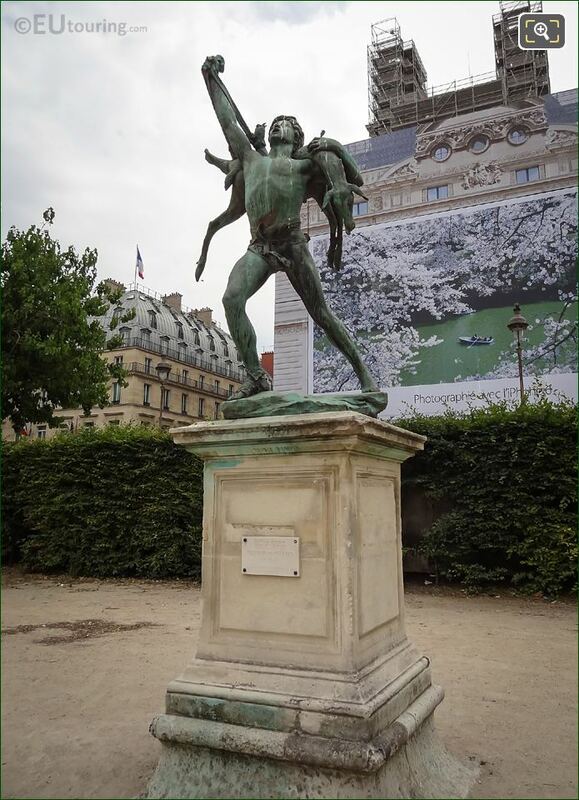 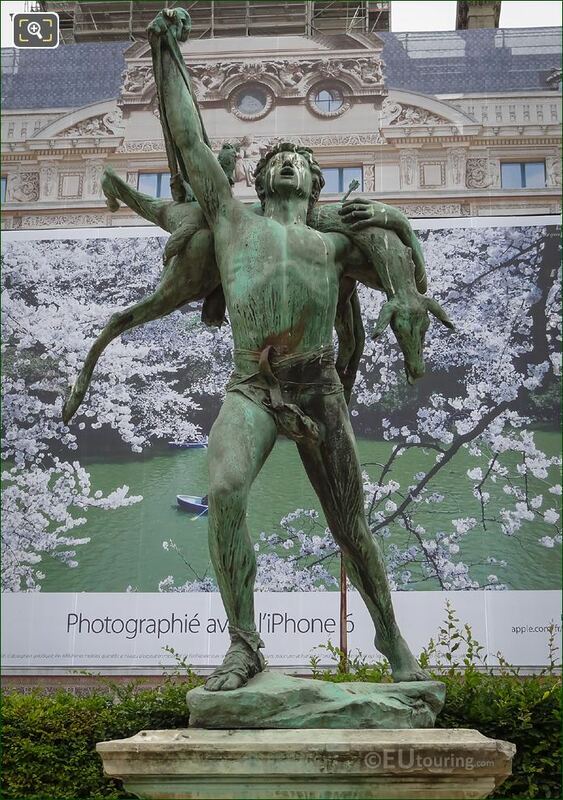 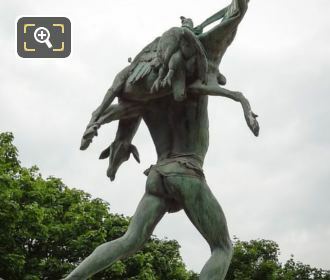 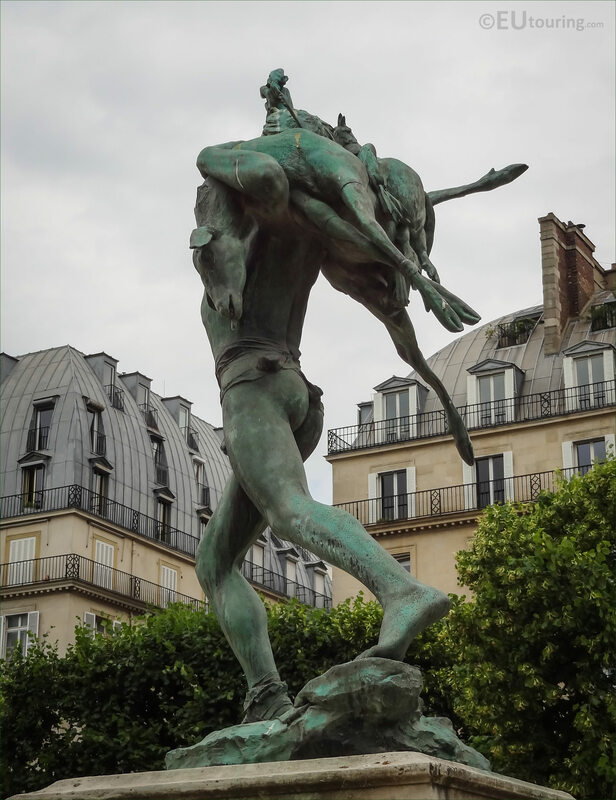 This first HD photo shows the statue of Retour de Chasse, which in English translates to Return from the Hunt or Back from Hunting, and as you see, this depicts a young man carrying a deer that he has killed. And here you can see that this statue is located within the Jaridin des Tuilleries on the northern side on a walkway called the Esplanade des Feuillants and behind you can see a part of the famous tourist attraction in Paris called the Musee du Louvre, yet this wing called the Pavillon de Marsan was undergoing renovation works when we took these photos. 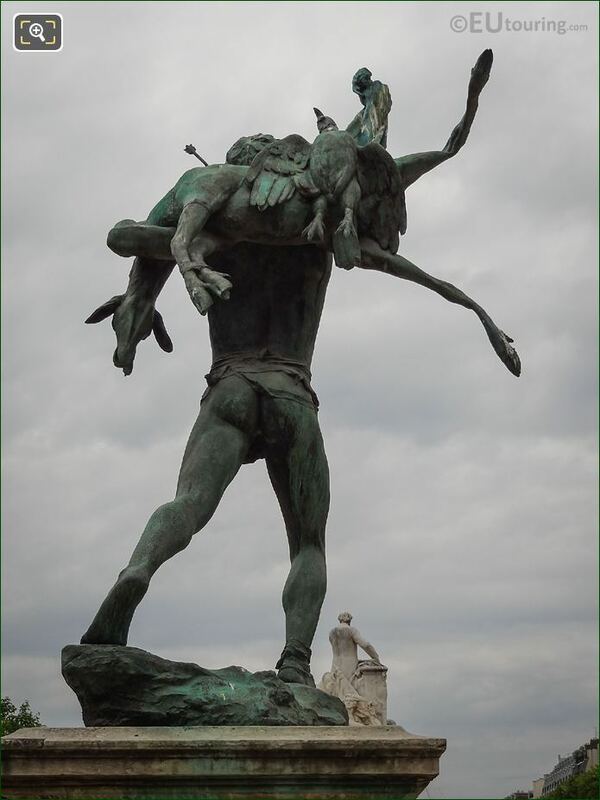 But this image shows the left hand side of the Return from the Hunt statue with the man holding a dead deer walking back over rocks, which was sculpted by Antonin Carles who was born in Gimont in the south west of France in 1851 with a full name of Jean Antonin Carles. 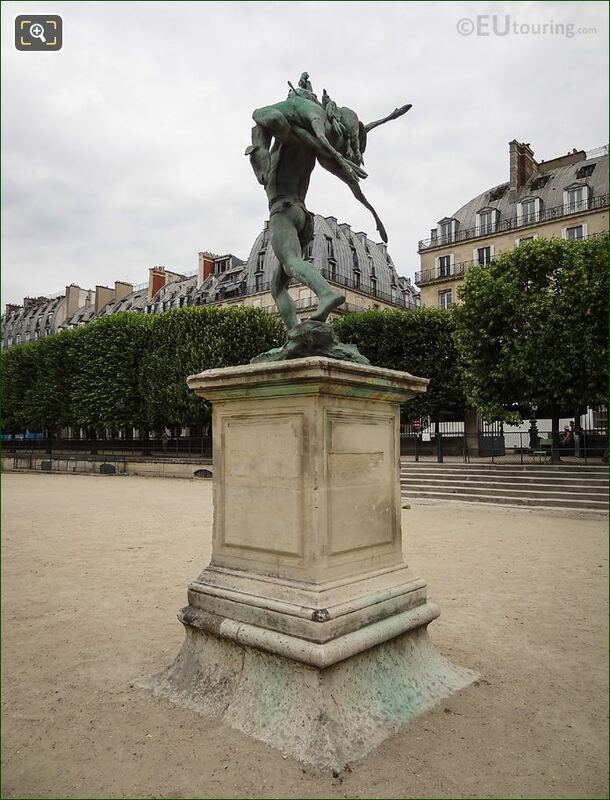 Always just known as Antonin Carles, he initially studied in Marseille, the at the Ecole des Beaux Arts in Toulouse before entering the school of fine arts in Paris under Francois Jouffroy to become a French sculptor and started to exhibit works at the Paris Salons, with a plaster model of this statue being presented at the 1885 Salon, item number 3872. 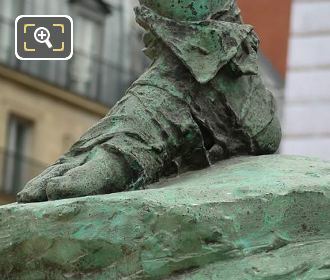 So this image shows a side view of the statue and if you look very carefully at the base, which was designed to be a rock, just underneath the right foot you will see the name Thiebaut Freres Fondeurs who was one of the largest and most prestigious French art foundries during the 19th and 20th centuries, and this bronze statue of Retour de Chasse was cast in their Paris foundry back in 1888. 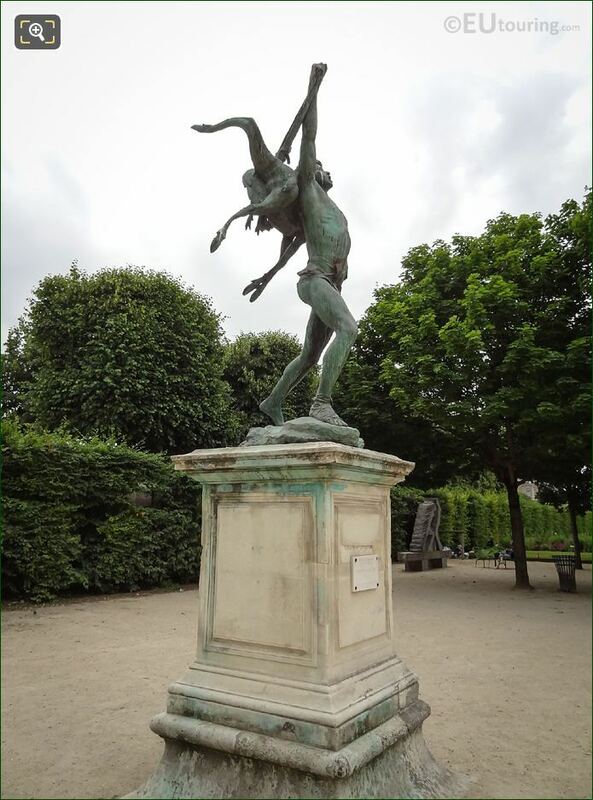 In fact, this particular sculpture was acquired by the French state by a formal decree dated 30th June 1888 for the sum of 4000 French Francs and provided to the Thiebaut Freres foundry on 1st November 1888 to be cast in bronze, subsequently being assigned to the Musee du Louvre and placed within the Jardin des Tuileries in 1890. Now the Retour de Chasse was initially placed on the alley walkway to the east of the Orangerie, but by an order dated 18th July 1910, this was moved to a cross aile by the north basin, yet was finally re-erected yet again in 1923 on the stone base, and again back in the same walkway sometimes known as the Ailley of Orange, or alternatively the Esplanade des Feuillants. 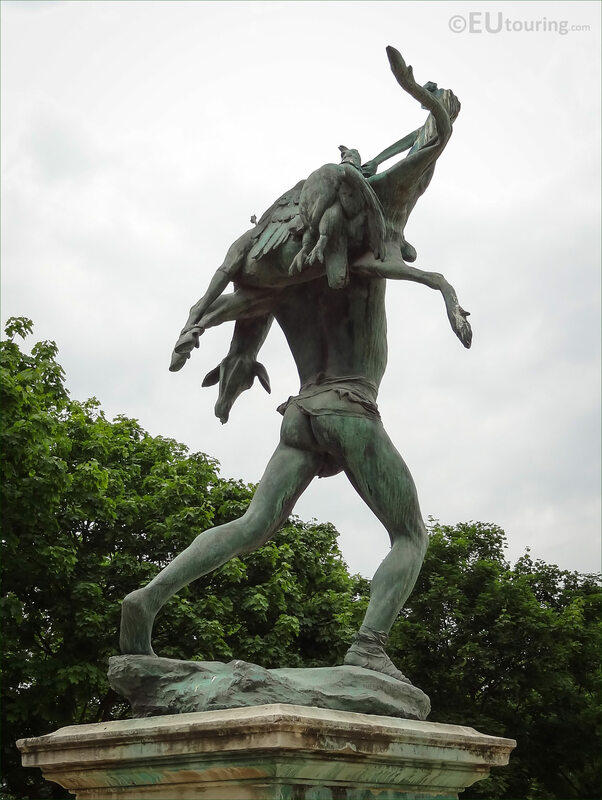 However, even though the Return from the Hunt is always referred to as the young man carrying a deer, still with the arrow that the animal was killed with, you can also see that there is a dead bird as well, which shows the skill that Antonin Carles put into this composition and he was the winner of the Grand Prize at the 1889 Universal Exhibition in Paris. 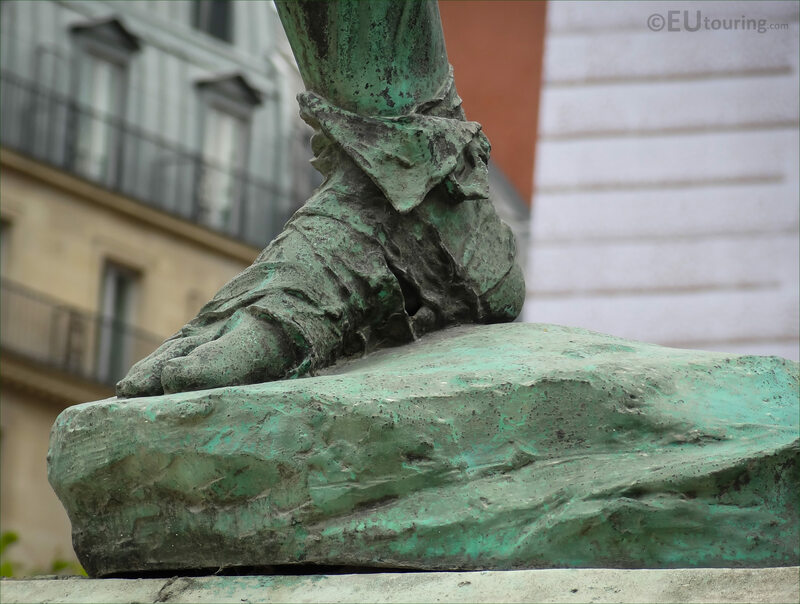 But this close up photo shows even more detailing just with the right hand foot of the bronze statue sculpted as though it is wrapped with a cloth, even though the other foot and ankle is bare, and it was this statue of Back from Hunting that got Antonin Carles the medal at the 1889 World Fair, which is actually the same year that the most famous tourist attraction of the Eiffel Tower was first constructed. 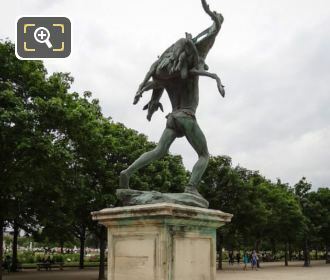 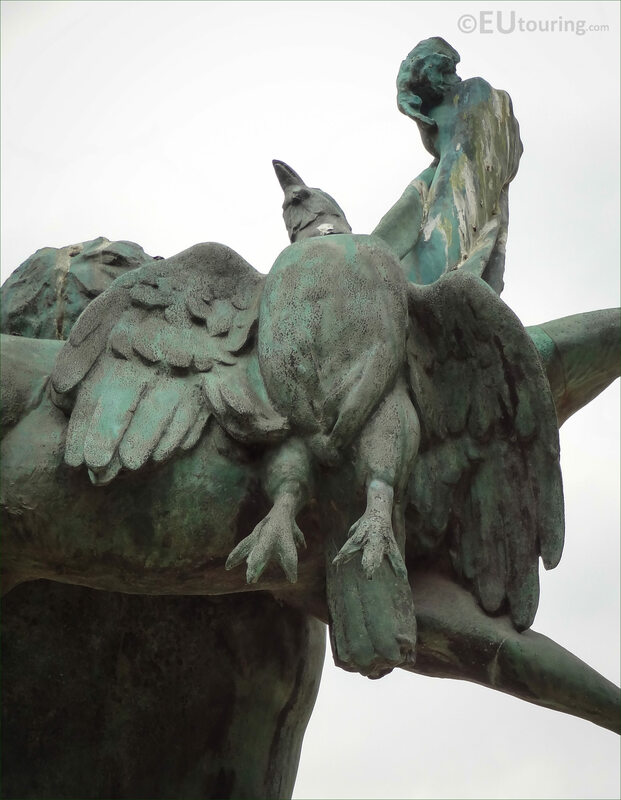 Yet this next close up high definition photograph shows the bird that the young man has also killed while hunting, which to us looks like it is a pigeon and this is a very common sight around the city of Paris and France in general, although the live versions do tend to make rather a mess of many statues and sculptures! 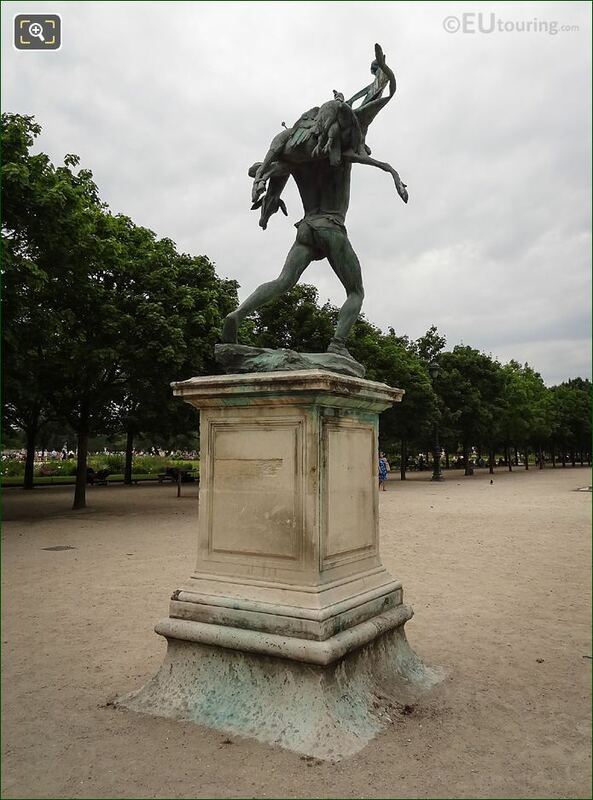 So this next image shows the head of the young deer, and subjects such as wild animals and hunting were very popular in the 1800s, even though they can be quite distressing to some people these days, but hunting for food was a way of life in the past, although royalty used to hunt for pleasure and even a part of the Tuileries gardens was used for this purpose. Now we mentioned earlier that the Retour de Chasse was assigned to the Musee du Louvre in 1888, but in 1986 this bronze statue was re-assigned to the Musee d'Orsay under inventory number RF 838, which is another popular museum in Paris, and they now maintain this sculpture along with many others around the city. 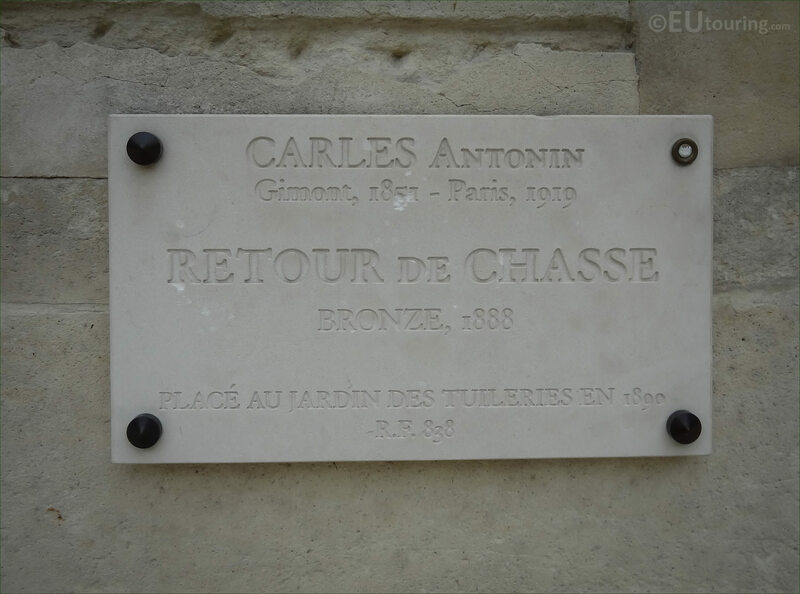 And even though the original plaster version can no longer be found, there is a drawing of the Retour de Chasse that was produced by Antonin Carles prior to the finished version you can see here, and this is now held within the Department of Graphic Arts at the Musee du Louvre, which was originally held within the Musee du Luxembourg. 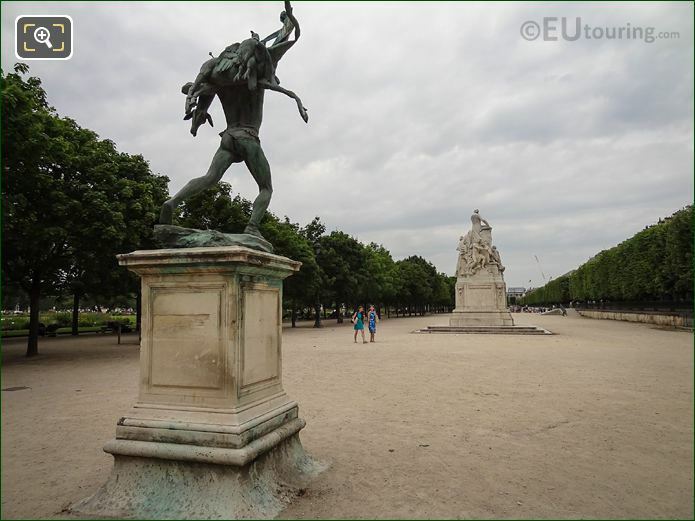 We also mentioned earlier the Esplanade des Feuillants of the Jardin des Tuilleries, which is the long walkway to the north of the garden that you can see in this image, and we took this while looking towards the west end of the garden by the Place de la Concorde, and the famous Rue de Rivoli is to the right hand side. 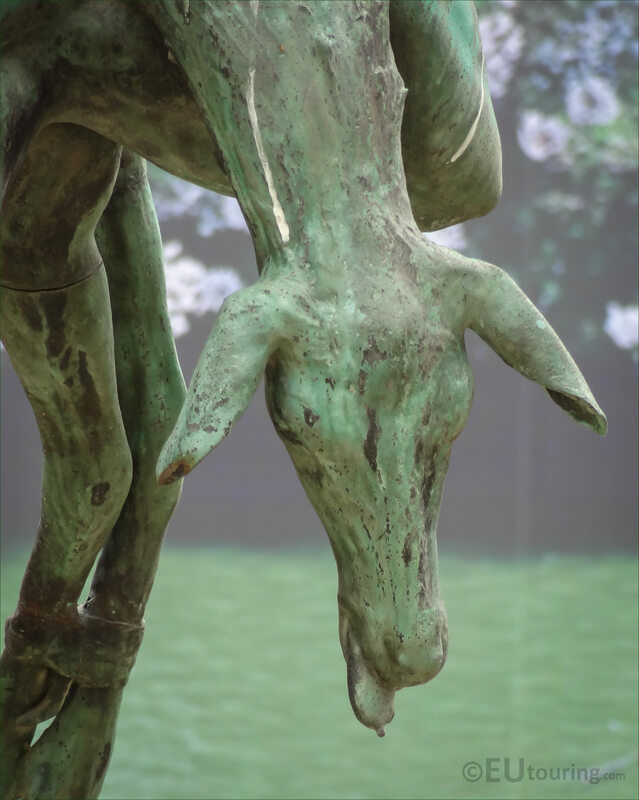 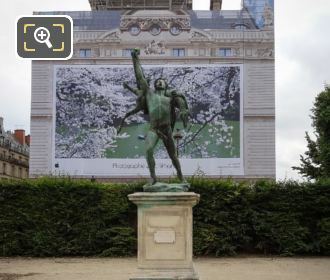 You will also find that the statue of Return from the Hunt measures a height of 2.5 metres not including the stone pedestal base, and according to the Musee d'Orsay it was actually signed by Antonin Carles on the base of the bronze statue along with the year of 1888. 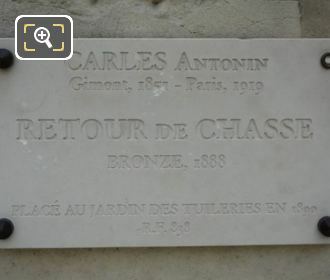 However, the last image for this section shows the plaque, which is located at the front of the pedestal base, and as you can see, it mentions the years of birth and death of the artist, being 1851 to 1919, and works of Antonin Carles can now be found in many different museums throughout France.